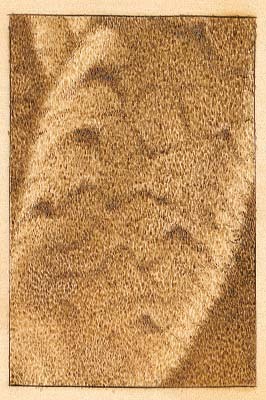 When burning a realistic representation of an animal coat, it's important to select a nib with the correct profile and use it in such a way as to reproduce the texture and look of the animal. Experimentation shows what is possible. 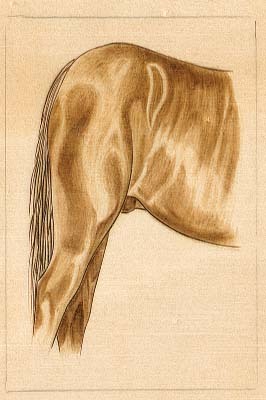 Given experience and knowledge, there is little that can't be reproduced in pyrography. 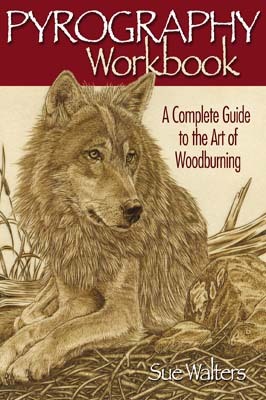 In this article, we will explore vastly contrasting types of animal covers and how the three basic nibs - skew, writer and shader - can be manipulated in various ways to reproduce some realistic effects. The skew has a straight, often knife-like edge and is good at producing fine, crisp and precise lines. The writer, like a pencil, has a pointed or rounded end which will go in any direction, making it ideal for writing and tight curves. The shader comes in many shapes and sizes and is designed to scorch large areas of wood. 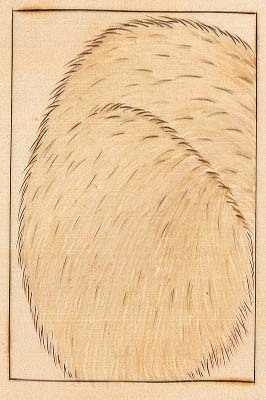 a pencil to map the direction of the fur onto the wood. You can also burn in a few indicator marks with a skew. Here, I have burned the first layer of hair except for the front of the leg to show you the contrast between the two (see photo 2). 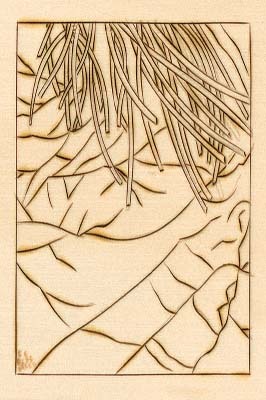 Using the skew, start filling in the first layer by burning random, overlapping, staggered lines. 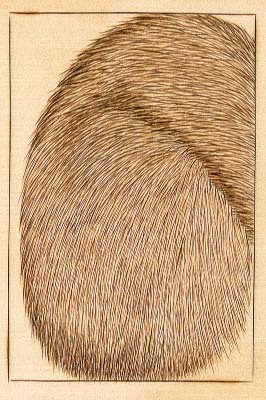 The length of the line will depend on the length of the hairs in the animal's coat. A longhaired section of coat will require a longer stroke. Don't try to fill in the coat all at once. You can always add more hair later if you don't think it's thick enough. 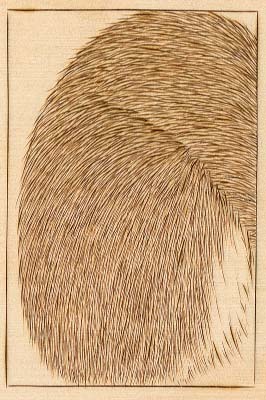 Now it's time to add some curves and shadows to the animal by burning additional darker hairs in these areas (see photo 3). 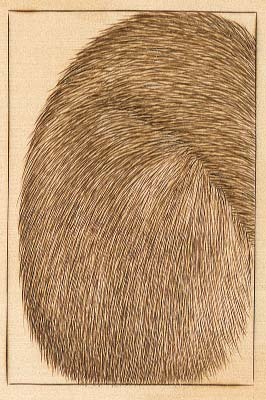 Try not to burn these hairs in a row; instead, burn random, staggered lines among the existing hairs. Blend the two areas together by dragging some dark strokes out into the existing coat. Once the shadows are dark enough, you can then darken any other parts of the coat by burning additional lines in these areas (see photo 4). We don't want the dramatic darkness of a shaded area, so these lines will be slightly darker than the original level of hair and will be spaced out so as to blend easily with the surrounding coat. For that extra touch of realism, use a blade to scrape away areas you think need defining, or are too dark. I try to encourage people to burn what they see, not what they think they see, or what they know is there. Just because we know a horse has hair doesn't mean we see that hair. 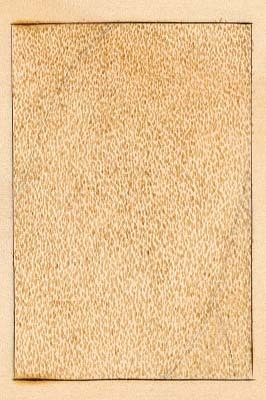 Some animals, especially when viewed at a distance, appear to have a coat as smooth as an apple. 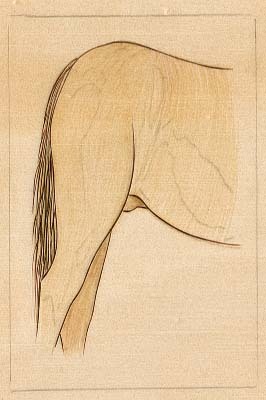 Use a skew to outline the crisp, sharp edge of the horse (see photo 5). Outlining is only used to define physical things but not for changes in colour, e.g. 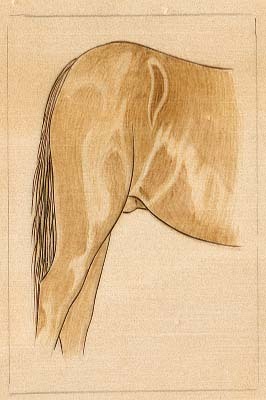 the leg or outside rump is edged, but no change of coat colour or shading is edged. 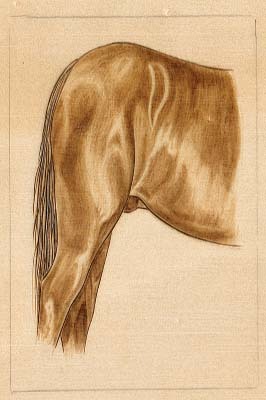 Here the distinctive changes of colour on the coat have been mapped lightly with pencil (see photo 6). The entire coat has been very lightly toned all over with a shading nib to create a smooth texture. For a more realistic look, it's important to curve the overlapping tone lines along the shape of the body. Even if your stroke work is a little patchy, this helps to marry the burning to the shape of the animal. Like water, the darker, distinctive shapes are then filled in with the shader (see photo 7). 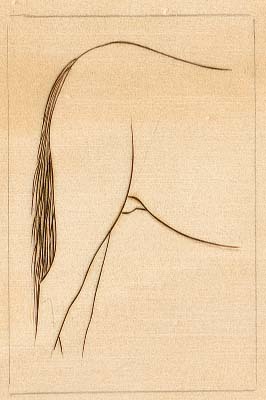 Always make sure that the strokes follow the lines of the first level - follow the shape of the animal. If you have to, tip your shader on its toe to fill in and blend any patchy areas. Any areas that are very dark are now burned on top of the original two layers (see photo 8). Gently add another patch of darkness on these areas, blending any hard edges between two contrasting tones. You may have to turn the heat up a little to make an impression on top of previously burned levels. Use the shader to gently fill in any mid-tones, leaving only the highlights untouched (see photo 9). 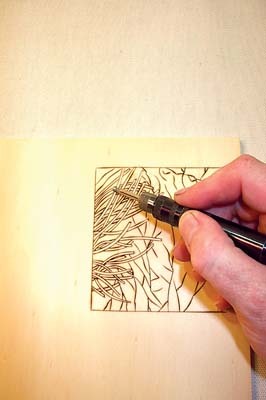 You can use a blade to gently scrape away any mistakes or re-establish highlights. A blade is useful to dull areas burned too darkly or blend the edge between two contrasting tones. 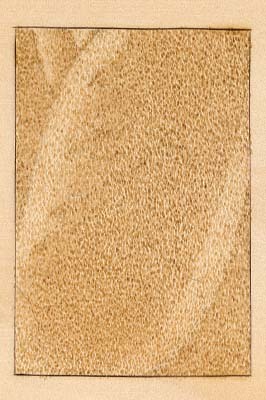 a physical texture to the piece, as well as a visual one. Try to develop a rhythmic, tapping pattern rather than placing each dot perfectly. If we follow the principle that the length of a burned stroke should match the length of the hair on the subject, then fluffy fur really has no length at all. All you can see are thousands of dots of hair protruding from the body. 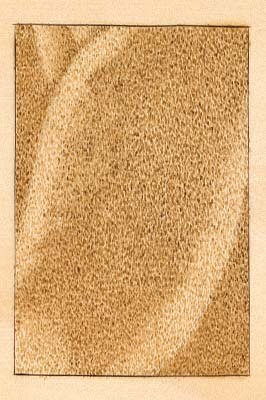 One way to represent this is to recreate the texture and length by overlapping thousands and thousands of dots with a writing nib (see photo 10). The colour of the first layer is quite light. We are really only trying to convey a touch of colour while creating a physical impression on the surface. Note how evenly spaced the dots are with no one area being overly saturated. 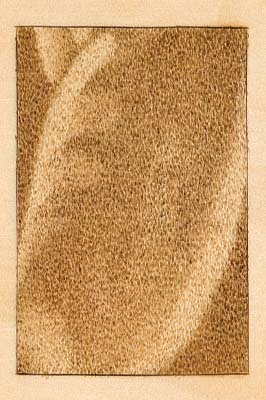 All but the brightest areas are then re-stippled in the same manner (see photo 11). You may have to turn the heat up a little more to enable you to make an impression over the first layer of burning. Resist the temptation to darken any area too quickly. It's very important that each level is gently built over the last. This helps blend each level and also greatly adds to the feeling of the depth of the coat. Any areas that need no further colour are to be left alone. All areas that need to be darker are then re-stippled over that entire area (see photo 12). Once again, you may need to turn the heat up on each subsequent level. Notice how the gradual build up of levels is starting to add a real sense of depth to the coat. 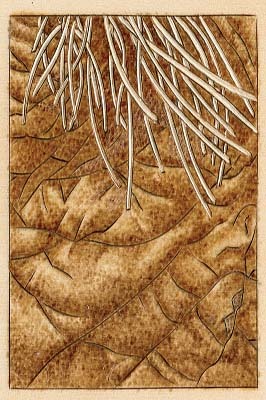 Once again, another layer of stippling is added only where the object needs to be darker (see photo 13). Notice how this additional layer of dots has defined the shape of the arm. The background behind the arm has also been darkened on each subsequent level. At long last, the final dark layer can be added (see photo 14). 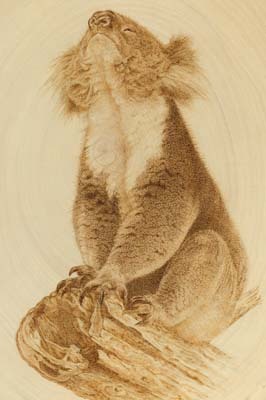 By this stage, the only dark areas to be filled in are the background and the gaps on the koala's coat. If any levels seem to stand out from their surrounding areas, blur the edges by using a few dots to blend the two patches of tone together. A blade can then be used to highlight areas as needed. Burning the look and texture of elephant skin illustrates just how versatile pyrography can be when you choose the right nib for the right job and use it in the correct manner. 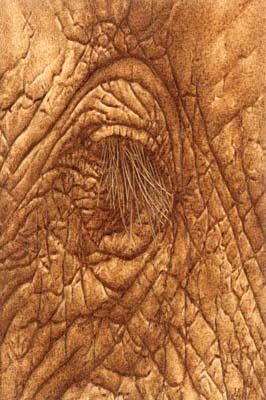 Like the koala fur, the skin of the elephant is created by building up a series of dots. Instead of using a writing nib, which creates a tight pattern, we will use the bowl of a spoon shader to dab on layers of fat splodges. This technique is not limited to elephants alone. Some other things it can reproduce are reptiles, leathery human skin, and other tough-skinned mammals. Here, we will study this technique by burning a portion of an elephant eye and surrounding skin. Only two types of nibs are used to complete this image: a skew and a spoon shader. 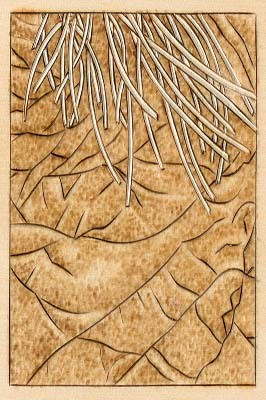 First, the skew is used to deeply burn the outline of all the eyelashes (see photo 16). Take care not to cross over lines where the eyelashes overlap or underlap one another. The creases of the skin are also burned using a skew. 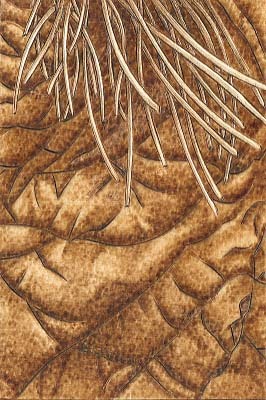 a burr to carve out a smooth trench between the burned lines of each eyelash (see photo 17). This drops the level of the eyelashes below that of the burning surface and it should remain untouched during the burning process. Tap the bowl of the shader all over the entire piece in a random, overlapping pattern. Use only a light colour for this first coat (see photo 18). Like the koala, we are trying to establish texture, rather than heavy colour. Turn the heat up slightly to allow you to make an impression over the initial layer of burning (see photo 19). Stipple a slightly darker layer over the entire piece, but leave alone any areas that are to remain brightest, such as those where the light is catching the peaks of the protruding skin. Turn up the heat slightly again to stipple another layer on the areas that need further darkening - any other areas are now left alone (see photo 20). It's important that you don't try to build the darkest areas all at once. It is better to gradually build each level of darkness to create a sense of depth and to allow for smooth blending. Add yet a further layer of dark stipples to any areas that need it (see photo 21). In this case, those areas are the dips in the creases and the area under the eyelashes. Lastly, stipple the last dark lines right along each crease (see photo 22). This creates a strong shadow that emphasises the depth of the crease. A skew is then used to darken any underlying eyelashes. For added realism, a dark shadow line can be burned on the lower hair where the top hair crosses over it. Photo 23 shows how the finished pyrographed eye should look. Before you begin the steps, practice burning short lines in a random, overlapping pattern with your skew. To keep the lines from running together in a series of tram tracks, try to keep each line slightly askew to its neighbour. Little in nature is straight, so learn to curve each line slightly. Try to develop a rhythmic stroke, blanketing the area rather than deliberately placing each line in exactly the right place. To order your copy contact GMC Publications.